X11RDP-o-Matic Version 3.02 installed and running on Kubuntu 13.10. Thank you for Scarygliders Utilities. zino, please check – is clipboard working in your environment between windows and kubuntu ? I suppose that you also are connecting from windows to your kubuntu ? Happy to report that this is working on Ubuntu 13.10. No errors during running, or during RDPsesconfig.sh. I’m using XFCE, as I read about 13.10 having broken packages for some of the necessary non-unity Gnome stuff. Everything works great except that the session doesn’t completely die when you log out. All that’s left is the desktop background. You have to manually kill X11rdp to get it to completely disconnect. Has anyone see this? Any workarounds? Will I fare better with LXDE? Works great for me on Linux Mint 15 Olivia (Ubuntu clone) with the LXDE desktop, inside a virtual machine (KVM). All 64 bit. I used your script after the default packages gave me trouble. Please SET THE DEFAULT ENCRYPTION LEVEL TO HIGH. The current default is “low”. I know, it’s the Xrdp upstream default. Still your script should default to “high” IMHO. – Screen (auto)resize does not work due to some xrandr error or whatever. Might also be a Debian derived bug. – A bit stupid is the 2x password input requirement when logging in into a sleeping session: sesman-X11rdp AND screen lock (XScreenSaver 5.15). These problems, however, are more related to xrdp upstream than to your script, which worked flawless. Maybe your script can incorporate the PA sink some day. Thanks. I’m really happy with my virtual desktop using xrdp. On the local network, even viewing (and listening) YouTube clips using Firefox with the Adobe flash plugin works. Addition: after some time not using it, audio stops working. guys, what about clipboard ? I’ve installed X11RDP-o-Matic Version 3.01 on Xubuntu 13.10 and succesfully connected via mstsc from win7 via sesman-X11rdp, but clipboard between xubuntu and win7 doesn’t work. I can’t copy any text from terminal to windows and vice versa. Once again, you’ve not installed o-matic! You’ve ran o-matic , which then builds and installs xrdp and x11rdp. 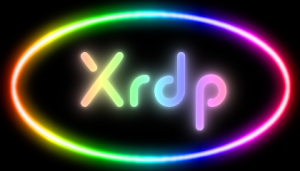 If you have an issue with xrdp and/or X11rdp, please ask the author(s) on the xrdp mailing list. Oh.. my bad.. you are right. thank you. First, let me say, “Hats off to you” for even writing any software at all. I’m a lazy bugger that’s never done anything like that. Also, glad you’re out of that Japanese place. Hope everyone’s fine. Now, I came across your site from a post of Reddit, so forgive me. I don’t see anywhere on your site that actually describes what your software does. I expect it has something to do with the RDP protocol, but I can’t find where you describe how it is an improvement over rdesktop (which I currently use). Also, since I am new to your software, perhaps you can direct me to the link on your site where you demonstrate the process of using your software. I am excited to try out any improvement over rdesktop which, while it works good enough, does not have the enhancements I find in Microsoft’s Remote Desktop Connection. Silly me, I can’t find the URL to your man page either. I’m sure I’m foolishly over-looking the permanent links you would have made on your home page to your documentation. I’m getting on in years and these things often escape me, sadly. I did find the little menu bar at the top but it only shows Home, About, RDP FAQ, X11RDP-o-matic Downloads page. Perhaps, it’s my browser that’s to blame but I just can’t seem to find any relevant documentation about the software that you’ve obviously spent so much time to develop. It’s a shame that I won’t be able to use it. When installing this, I noticed how much was being built and downloaded. What is the estimated size after installing? Yep! :) You’re basically building almost an entire Xorg tree, as that’s currently how the X11rdp binary works. I ran it on Lubuntu 13.04. I had xrdp set up before but I wanted to connect to the console session. Before it required that I tried to login twice – first time always failed. Now I can’t connect at all. When the xrdp window opens prompting to select how I authenticate – every selection fails in its own way. I’ll like to give a more detailed feedback but don’t know how. Btw the script is very slick. It ran about 5 hours on my dualcore atom with downloads taking the first hour. freshly installed stuff – that’s one major cause. Also, do you know for sure o-matic ran without a hitch? then we can at least see if the packages were created. Uhoh. I didn’t purge xrdp beforehand. I’m assuming you still have the XRDP-o-Matic directory on your system. 5) sudo dpkg -i xrdp/xrdp_0.7.0-1_.deb (where is whatever the arch is. Do let me know how you got on. Followed your advice. Purged and reinstalled the packages. I can now start a new session with sesman-x11rdp. ᶺ_ᶺ Hooray! Am I correct to assume that the only way to pick up the console session is by installing vnc? Yes, the “console” session uses the Xvnc back-end – I think all you need is the Xvnc package for that. Looks like I already had vino installed but it wasn’t running. All is well now! Kevin, thank you! Kevin, thanks for this script. Install went perfect on Kali Linux. I am having an issue with Mint 16. This did not happen with my previous install of mint 13 but then I was using an older version of o-matic so Im not sure what the culprit is. My problem is this, I cannot control the desktop remotely as I would if I were sat in front of it. Things that require elevated privileges like changing the networking options, or even hibernating from desktop. I can sudo the command but Im not a linux wiz yet, so I need some access to the desktop! I have gone through the polkit files one by one and altered the inactive parts to mimic the active connections. Still no go. I have even edited some to say “yes” instead of allow_auth etc, but with no apparent affect on how the desktop gives me access. Ive tried searching for xrdp and permission problems and come up with things about an Xauthority file but that hasnt worked either. startlubuntu (which the setup script uses by default) no longer exists – this seems to be the only way I could find that works. Everything works fine now except that every time I log in, it creates a new LXDE session, and doesn’t re-use the same session (which is what i want). These sessions are sitting around like zombies on my box. I’m using identical saved resolution etc settings each time (I’ve already read through the comments!). Yep, there seems to be an increasing amount of people saying this – o-matic’s merely a build tool for X11rdp/xrdp, so, the problem appears to be something caused by upstream. When I get the time I’ll ask about it. Hello. I could successefully build xrdp and X11vnc on Lubuntu 13.10 and i can connect from windows to the linux machine. But it does not use existing session. Every time i connect the new session is created. If i manually restart xrdp with “sudo service xrdp restart” it starts to work, but if i reboot the system it happens again. Any suggestions? Thanks for the fast reply. Is there some version of xrdp that is known to work? You could try the --bleeding-edge option from o-matic – that switches to the Neutrinolabs xrdp repository. In the very near future, I’m going to be changing o-matic to use the Neutrinolabs github repository – as Jay Sorg – the main xrdp/X11rdp developer – is going to use that as his main repository. I will be either removing the --bleeding-edge switch or changing it so that by default o-matic uses the master neutrinolabs/xrdp repo, and –bleeding-edge will point to a development branch off that. So for now, the --bleeding-edge option will download from the neutrinolabs/xrdp master repository. Hello, I just did a fresh install X11rdp-o-Matic on Ubuntu 13.10 x64 successfully. Then I ran the RDPsesconfig and selected xcfe for desktop. I can RDP to the Ubuntu from my Windows PC fine and see the xcfe desktop. However, when I try to go to Terminal emulator, I just get blank screen. I can go to System -> xterm fine and access command line, but Terminal emulator is all blank screen. Please ignore. I had to changed the background and text color, and now it works. I am unable to get this working on the Ubuntu 13.10 x64. The scripts seem to work fine, but when I login, I see a black screen, with a black mouse. I’m logging in from Win8.1. I’ve tried both classic mstsc and the new modern app. I’ve tried all the desktops (gnome, kde etc), and I get the same result on all of them. Is there something I can try? Try connecting with a lower colour resolution – from 32 to 24, or 24 to 16? When I get the time I’ll test this out as well – I may have to put something in the FAQ for this. Then the box disappears and I’m left with the black screen. If I choose something other than susman-xrdp, I can get a grey screen with an X for a cursor, but same result of not having a functional remote. Did you use RDPsesconfig.sh to select which desktop environment to start after logging in? Worked for me: Linux Mint 16 (mate) x64, with mate as desktop environment in X11RDP sessions. Now I can use standard Windows (8.1) MSDTC to connect. The off-the-shelf Xrdp didn’t work for me even with gnome-fallback-session. I wonder whether the refreshed config provided by -o-matic would have been sufficient, or whether there are code fixes needed as well? One display botch is consistently reproducible: small black squares surrounding the checkbox and OK button on the Linux Mint welcome screen shown on each login. bobhy, thanks for the feedback. The off-the-shelf Xrdp didn’t work for me even with gnome-fallback-session. I wonder whether the refreshed config provided by -o-matic would have been sufficient, or whether there are code fixes needed as well? I’m having the same issue as Anil – seeing a black screen. Does anyone know if this was resolved and if so, how it was resolved? Thanks! Hi, your script works fine for me on Debian testing (jessie)/XFCE – many thanks. However, I would like to be able to remotely log in to an existing session started on the local machine. I found a few links on how to do this (using vino) but no luck getting it to work. Vino seems to need a lot of Gnome stuff which I don’t have. Have you got any suggestions? Cheers! You should read the FAQ page, and also it’s better to ask questions in the latest X11RDP-o-Matic blog post – this post is rather old now as o-matic is now at v3.10 (and soon v3.11). Ubuntu 15.04 with LXDE doesn’t compile. You can go there and find latest version of xproto. I ran into this in trying to get this to work on PCLinuxOS.